Think Box Media has been a leader in offset litho printing in NYC for over 30 years. Utilizing the latest in Komori printing presses, we produce stunning, vibrant color for a range of products. We have two (2) full-size 6-Color presses. We are capable of running full color + (2) Pantone colors, as well as matte, satin, or gloss aqueous coatings. For a more pronounced effect, we can run your job with a full varnish or accent certain areas with a spot varnish option. In addition, we offer Soft Touch coating, which gives the paper a great velvet-like feel. Think Box Media is proud to offer environmentally safe green printing. Our machines only print with Soy-based inks rather than petroleum-based pigment inks. We also offer a wide range of post-consumer waste (PCW) paper stocks, which come in varying percentages of recycled content, from 5%-100%. When requesting your quote, mention that you would like to use a PCW stock, and we will be happy to help. Our pre-press department will ensure your files are ready for print. Our trained operators will inspect all elements of your files and alert you should there be any issues. To confirm everything is approved, we supply both low-resolution mock ups, and high-resolution color-match Epson proofs calibrated specifically to match our presses. Once the jobs are off press we can help with a wide variety of finishing options in our bindery department. Offset printing is one of the most commonly used printing techniques for high-volume orders. 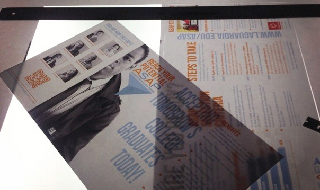 The process entails the inked image being transferred to a rubber blanket and then to the printing surface. Since the rubber blanket in offset printing conforms to the texture of the printing surface, this method produces sharp and clean images and text. This type of printing also utilizes ink instead of toner, leaving colors richer and lines finer and cleaner. Offset printing rapidly produces printed paper at rates that tend to be much faster than other printing methods. The quick production time makes this type of printing highly suitable for products that consist of many sheets of paper such as books and catalogs, especially those that need to be printed on a tight deadline. Offset printing is typically the most affordable method when it comes to printing in large quantities. The cost per copy decreases as more are printed. Think Box Media gives companies a choice between satin, matte, and high-gloss finishes, as well as different paper types including hi-bright, newsprint, and offset paper types. With a variety of options available, companies can achieve the desired look for their printed products. Offset printing is suitable for many different printing surfaces, leaving a number of options open regarding what type of surface a specific work or copy should be printed on. Think Box Media offers offset printing options to companies and businesses within the NYC area that are looking to produce high-quality prints in large quantities. Different finishes and methods are available, leaving room for customization. We also offer large format printing for businesses that are looking to produce copies or prints that are suitable for event installations, retail spaces, and more. In addition to offset printing, Think Box Media also offers digital printing for smaller print runs. Both our offset and digital equipment are calibrated on a constant basis to ensure we give our clients the highest quality printed products possible. Our offset and digital print equipment are state-of-the-art and guaranteed to satisfy your color requirements. Our pre-press department before going to production meticulously inspects all orders. All orders are proofed and approved by clients and later matched on press to make sure you get a great final product. Please call us today to request a quote. We’re looking forward to working with you.